9. GEORGE WASHINGTON4 RILEY (NEEDHAM3, JOHN2, EDWARD1) was born 1832 in Alabama, and died 1892. He married LYDIA LETTIE BRANNON. She was born 12 Mar 1840 in Dale County, AL, and died 17 Dec 1899 in Midland City , Alabama. i. JAMES WESLEY5 RILEY, b. 12 Mar 1858.
ii. MALINA RILEY, b. 25 Sep 1860.
iii. LENORA RILEY, b. 24 Dec 1861; m. THOMAS R. MYERS. iv. ELIZABETH RILEY, b. 16 Oct 1864.
v. MISSOURI C. RILEY, b. 10 Nov 1866.
vi. RHODA A. W. RILEY, b. 01 Jan 1868. Notes for IDA M. ROBERTSON: Newspaper biography of JEZ Riley indicates Ida was from Birmingham , AL. viii. LUCINDA ARTIMISSO RILEY, b. 20 Sep 1872.
x. LETTIS RILEY, b. 1876.
xi. HETTIE VIOLA RILEY, b. 10 Aug 1877.
xii. ROBERTA ANZILLA RILEY, b. 05 Nov 1880.
xiii. HATTIE RILEY, b. 12 Apr 1884. 10. EMANUEL4 RILEY (EDWARD3, JOHN2, EDWARD1) was born 1825 in Darlington District , South Carolina, and died Bet. 1864 - 1870. He married JUDAH Abt. 1849. 23. i. NELLIE5 RILEY, b. 1850, Echo, Dale County, Alabama; d. 1910, Phenix City , Alabama. ii. JOHN W. RILEY, b. Jan 1852; m. SARAH OUTLAW. 24. iii. ELI H. RILEY, b. 1854, Alabama. 25. iv. DAVID RILEY, b. 1856, Alabama. v. POLLY MAE RILEY, b. 1860, Echo, Dale County, Alabama; m. W. R. WRIGHT, 03 Dec 1901, Echo, Dale County, Alabama. vi. SARAH J. RILEY, b. 1862.
vii. ISABELLA RILEY, b. 1863; m. J. E. RILEY, 23 Mar 1898, Echo, Dale County, Alabama. viii. LOUISA RILEY, b. 1864.
ix. READY RILEY, b. 1867.
x. REDDICK RILEY, b. May 1875. 11. WESLEY4 RILEY (EDWARD3, JOHN2, EDWARD1) was born 24 Jul 1832 in South Carolina, and died 16 Jul 1904. He married NANCY MARIA GALLOWAY 05 Feb 1860. She was born 19 Feb 1840, and died 11 Aug 1902 in Alabama. on 7/22/1864. He was held as prisoner of war at Johnson's Island POW depot located in Sandusky Bay, Lake Erie , Ohio. He arrived at the prison on 8/01/1864 and released on 6/15/1865. Additional information is recorded and maintained at the Center for Historic and Military Archaeology at Heidelberg College. Most of this info from Johnson's Island Historical Society. i. LUCINDA5 RILEY, b. 1862.
ii. HENRY RILEY, b. 1867.
iii. WILLIAM BRYANT RILEY, b. 20 Feb., 1868; d. 23 Nov., 1954.
iv. ASA E. RILEY, b. 1871.
v. JESSE M. RILEY, b. 1872.
vi. MARY E. RILEY, b. 1874.
vii. ARCHIE W. RILEY, b. 1876.
, and died 1909. He married PIETY ANN ENFINGER Abt. 1867, daughter of ELLIS ENFINGER and MATILDA TILLER. She was born 11 Nov 1847, and died 31 Dec 1916. 26. i. JOHN E.5 RILEY, b. 25 Nov 1870; d. 19 Mar 1930. 27. ii. MILLAGE WALTER RILEY, b. 22 Mar 1874; d. 08 Jun 1951. 28. iii. JAMES IRVING RILEY, b. 24 Mar 1876; d. 05 Jul 1953.
iv. ELIZA JANE RILEY, b. 12 Oct 1879; d. 27 Apr 1935.
v. MARTHA RILEY, b. 14 Feb 1880; d. 29 Oct 1963.
vi. DELLA RILEY, b. 01 Sep 1888; d. 31 Dec 1971. 13. GINCY4 RILEY (ABRAHAM3, JOHN2, EDWARD1) was born Abt. 1849 in Alabama. She married WILEY A. HALSTEAD. He was born Mar 1850, and died 30 Jun 1899.
i. LUCY5 HALSTEAD, b. 1875.
ii. ABRAHAM HALSTEAD, b. 1875.
iii. HARRIET lENORAH HALSTEAD, b. 1877.
iv. MANDA L. HALSTEAD, b. 1880.
v. NELLIE HALSTEAD, b. 1884; m. EARLY WOODHAM. vi. JONAH HALSTEAD, b. 1886.
vii. JOHN B. HALSTEAD, b. 1890. 14. WINIFRED4 RILEY (ABRAHAM3, JOHN2, EDWARD1) was born 1849 in Alabama. i. BRYANT MASON5 RILEY, m. MARGARET JOANNA WOODHAM. 15. CURTIS4 RILEY (ABRAHAM3, JOHN2, EDWARD1) was born May 1852 in Alabama. He married MARY JANE SPEARS, daughter of UNKNOWN SPEARS and UNKNOWN. She was born Jun 1855.
i. JAMES EARLY5 RILEY, b. Jul 1880, Alabama. 29. ii. THOMAS (TOMMIE) JEFFERSON RILEY, b. Nov 1882, Alabama. 30. iii. JESSE PHILLIP RILEY, b. Mar 1887, Dale Co., Alabama; d. 25 Oct 1948, Houston Co., Alabama. iv. DONNIE RILEY, b. Apr 1888, Alabama. v. MINNIE RILEY, b. May 1891, Alabama. 31. vi. PEARLIE RILEY, b. Jun 1893, Alabama. 32. vii. COMER RILEY, b. Aug 1895, Alabama; d. 1924, Geneva County , Alabama. viii. JOHN W. RILEY, b. Abt. 1897.
ix. SAMUEL RILEY, b. 1906.
x. UNKNOWN RILEY, b. 1908. Dale County, AL. He married (1) DILLEY ANN SAPHROMA GALLOWAY 26 Feb 1871 in Dale County, AL, daughter of EDWARD GALLOWAY and ELIZABETH WOODHAM. She was born 17 Dec 1852 in Dale Co., Alabama, and died 13 Feb 1910 in Dale Co., Alabama. He married (2) ALZIRA BALCOM 08 May 1915.
i. JASPER ZINNAMON5 RILEY, b. 08 Nov 1871, Dale Co., Alabama; d. 06 May 1939, Miller Co., Arkansas; m. (1) MARTHA SULLIVAN, 01 Mar 1908; m. (2) JENNIE LEE GREEN, Aft. 1914.
ii. ELIZA RILEY, b. 20 Jun 1875, Dale Co., Alabama; m. HENRY WARD, 28 Mar 1895.
iii. MARY LIZZIE RILEY, b. 06 Oct 1876, Dale Co., Alabama; d. 22 Jun 1957; m. ENOCH TILMAN RILEY, 19 May 1901, Dale County, AL. iv. AMANDA RILEY, b. 14 Feb 1877, Dale Co., Alabama; d. 23 Sep 1888, Dale Co., Alabama. v. ANNA C RILEY, b. 26 Aug 1879, Dale Co., Alabama; d. 26 Dec 1905, Dale Co., Alabama; m. MARVIN DRIGGERS. vi. LAUTER T RILEY, b. 05 Oct 1881, Dale Co., Alabama; d. 18 Oct 1952; m. JOHN ARTHUR MIMS, 06 Jul 1905.
vii. JAMES MOSES RILEY, b. 01 Jul 1883, Alabama; m. MYRTLE SULLIVAN, Arkansas. viii. PERRY W RILEY, b. 12 Oct 1885, Dale Co., Alabama; d. 10 Aug 1898, Dale Co., Alabama. ix. DANIEL M. RILEY, b. 15 Aug 1886, Alabama; d. 23 Dec 1904, Alabama; m. RUTHY. x. MASON SELLERS RILEY, b. 04 Aug 1887, Echo, Dale County, Alabama; d. 21 Jan 1962, Shreveport, Caddo Parish, Louisiana; m. VERTA LEE COLLINS, 02 Jan 1913, Miller Co., Arkansas. xi. LAURA MAE RILEY, b. 31 Dec 1888, Dale Co., Alabama; d. 09 Oct 1962, Dale Co., Alabama; m. STERLING WARD, 11 Oct 1914, Dale County, AL. xii. MANUEL RILEY, b. 26 Nov 1890, Dale Co., Alabama; d. 10 Oct 1891, Dale Co.,Alabama. xiii. MARVIN RILEY, b. 18 May 1894, Dale Co., Alabama; d. 21 Mar 1981, Dale Co., Alabama; m. ALBERTA. Alabama . He married JANE JOHNSON 24 Aug 1876.
i. GEORGE5 RILEY, b. Mar 1880.
ii. LEROY RILEY, b. Aug 1882.
iii. ESAU RILEY, b. Apr 1885.
iv. OLIN RILEY, b. Dec 1886. 18. JAMES EDWARD4 RILEY (DANIEL3, JOHN2, EDWARD1) was born 22 Sep 1860 in Dale County, Alabama, and died 19 Aug 1947. He married LENORAH HALSTEAD 29 Apr 1887 in Echo, Dale County,AL. She was born 18 Jul 1867 in Dale County, and died 03 Feb 1942.
i. NANNIE5 RILEY, b. 22 Jul 1888, Echo, Dale County,AL; d. 08 Apr 1989; m. DEMPSEY WYATT HODGES. ii. ROSA LEE RILEY, b. 01 Jun 1891, Echo, Dale County, AL; d. 19 Jun 1985; m. TERRELL CAS KIRKLAND, 10 Feb 1911.
iii. BASCOM PITT RILEY, b. 29 Aug 1893, Echo, Dale County AL; d. 17 Mar 1945; m. LUTIE MURPHY. iv. JAMES TIPPY RILEY, b. 23 May 1896, Echo, Dale County , AL ; d. 09 Feb 1913.
v. SHOFNER AMELIA RILEY, b. 09 Jul 1898, Echo, Dale County, AL; d. 20 Nov 1989; m. (1) JAMES C. NEWTON; m. (2) B. C. PLEDGER. vi. MYRTLE C. RILEY, b. 19 Oct 1900, Echo, Dale County, AL; d. 28 Mar 1999; m. LEROY STRICKLAND, 17 Dec 1922, Headland, Alabama; b. 10 Aug 1899; d. 18 Sep 1986.
vii. FLOSSIE B. RILEY, b. 25 Oct 1902, Echo, Dale County AL ; d. 08 Jan 1994. 19. WILLIAM JAMES4 WARD (ELENDER3 RILEY, JOHN2, EDWARD1) was born 1834, and died 1886. He married (1) ELIZABETH (BETTY) JOHNSON. She was born 1835. He married (2) FRANCES ELIZABETH MILLER. He married (3) SARA SOWELL. She was born 1860.
i. LENORA5 WARD, b. 1857.
ii. ROBERT FRANK WARD, b. 1861; d. 1926.
iii. JOHN OWEN WARD, b. 1862; d. 1965.
iv. MARY ELIZABETH (MOLLIE) WARD, b. 1863; d. 1938.
v. ELIZABETH "LIZZIE"5 WARD, b. 1867.
vi. EMMA WARD, b. 1868.
vii. WILLIAM J. "WILL" WARD, b. 1869; d. 1943.
viii. BARTOW WARD, b. 1871; d. 1926.
ix. MACK CARLOS WARD, b. 1872; d. 1940.
x. STERLING5 WARD, b. 1877; d. 1915.
xi. ARNOLD MARVIN WARD, b. 1878.
xii. MINNIE LEE WARD, b. 1880; d. 1959.
xiii. JAMES COLEMAN WARD, b. 1882.
xiv. CLEVELAND WARD, b. 1883.
xv. LUCY E. WARD, b. 1886; d. 1888. 20. 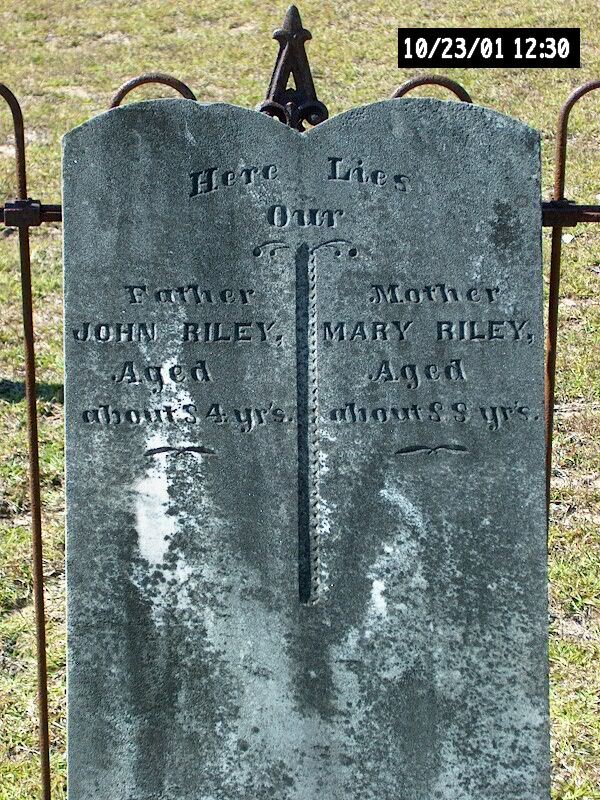 MARTHA ANN JINCEY4 WARD (ELENDER3 RILEY, JOHN2, EDWARD1) was born 23 Jun 1842 in Dale County,AL , and died 31 Jul 1909. She married (1) W. NEWMAN MEEK. He was born 19 Jun 1839 in Echo, AL. She married (2) C. C. TURLINGTON. She married (3) ARNOLD WIGGINS 25 Dec 1859. He was born 17 Jul 1828, and died 30 Mar 1863 in Tuscumbia, Colbert County , AL . i. ROBERT OSCAR5 MEEK, b. 13 Jan 1868.
ii. JASPER JOHN5 WIGGINS, b. 17 Sep 1860.
iii. MARY MELINDA WIGGINS, b. 08 Apr 1862. 21. LUCINDA ELENDER4 WARD (ELENDER3 RILEY, JOHN2, EDWARD1) was born 09 Aug 1857 in Dale County, Alabama, and died 03 Mar 1934 in Alabama. She married ROBERT MARION DAUGHTRY, son of JOHN DAUGHTRY and RACHEL WOODHAM. He was born 18 Aug 1847 in Alabama, and died 11 Feb 1918 in Hartford , Alabama. i. JOHN BRADFORD5 DAUGHTRY, b. 24 Aug 1879; d. 1942; m. WINNIE OMMIE ADAMS; b. 26 Jul 1889, Clay County, Georgia; d. Nov 1988. 33. ii. EDWARD JACK DAUGHTRY, b. 13 Jan 1882; d. 04 Aug 1942.
iii. WHIT C. DAUGHTRY DAUGHTRY, b. Dec 1883.
iv. LAURA ETHEL DAUGHTRY, b. 10 Dec 1887; m. GEORGE WASHINGTON JERKINS; b. 1883, Round Lake, FL. v. MARY ELENDER DAUGHTRY, b. 02 Oct 1897; d. 28 Jul 1973; m. ROY HERBERT JONES, Hartford , AL. 22. WILLIAM4 RILEY (MOSES3, JOHN2, EDWARD1) was born 02 Apr 1853 in Dale County, AL, and died 11 Dec 1900 in Dale County, AL. He married LAURA F. KEAHEY. 23. NELLIE5 RILEY (EMANUEL4, EDWARD3, JOHN2, EDWARD1) was born 1850 in Echo, Dale County, Alabama, and died 1910 in Phenix City , Alabama. She married (1) JOHN? RILEY Bet. 1869 - 1870 in Dale County, AL She married (2) ELIJAH WRIGHT 17 Apr 1891 in Echo, Dale County, Alabama. i. JOHN HARDY6 RILEY, b. 07 Mar 1871, Echo, Dale County, Alabama; d. 05 Jul 1943, Fortson, Harris County Georgia. ii. AMONETTE RILEY, b. Apr 1880.
iii. MOULTON6 WRIGHT, b. 1892. 24. ELI H.5 RILEY (EMANUEL4, EDWARD3, JOHN2, EDWARD1) was born 7 Sept. 1857 in Alabama. He married RHODY ANN BRANNON 06 Dec 1887 in Echo, Dale County, Alabama. i. DAYTON8RILEY, b. 04 Feb 1886, Dale County Alabama; d. 16 Feb 1918, Dale County Alabama. ii. DOROTHIE JANE RILEY, b. 09 Aug 1889, Dale County Alabama; d. 02 Apr 1919; m. ALTO LEE RONEY, 05 Aug 1906, Dale County Alabama; b. 24 Jan 1884, Dale County Alabama; d. 04 Oct 1964.
iii. CLETIE RILEY, b. 12 Mar 1891, Dale County Alabama; m. MYRT T. RONEY, 17 Sep 1907, Dale County Alabama; b. 12 Mar 1885, Dale County Alabama; d. 29 Mar 1952, Dothan, Houston County Alabama. iv. LONNIE SELLERS RILEY, b. 12 Jan 1892, Centerville, Dale County Alabama; d. 05 Oct 1957, Abbeville, Henry County Alabama; m. ESTELLE 'STELLA' RILEY, Sep 1912, Dale County Alabama; b. 07 Oct 1894, Centerville, Dale County Alabama; d. 13 Nov 1983, Abbeville, Henry County Alabama. v. LEILA RILEY, b. 17 Nov 1894, Dale County Alabama; d. 25 May 1985, Phenix City, Russell County Alabama; m. THOMAS HENRY RILEY, 29 Dec 1912, Dale County Alabama; b. 09 Mar 1891, Dale County Alabama; d. 26 Dec 1947, Smith Station, Lee County Alabama. vi. FLOY CATHERINE RILEY, b. Jan 1896, Dale County Alabama; d. Nov 1980, Prattville, Atugauga County Alabama; m. CHRISTOPHER CHARLES SKETO; b. 05 Dec 1889; d. Aug 1926, Houston County Alabama. vii. JAMES HERBERT (HUBBARD) RILEY, b. 23 Sept 1899, Dale County Alabama; d. Aft. 1950; m. CONNIE WRIGHT, 1916, Dale County, AL; b. 1895.
viii. CLAUDIA (CLAUDIE) B. RILEY, b. 17 Dec 1900, Dale County Alabama; d. Jul 1983, Wetumpka, Elmore County Alabama; m. (1) Fox Henderson (Spigner) SPEIGNER; b. 1896, on 17 Dec. 1916 in Georgia across river from Eufala, AL. ix. CARL BYRD RILEY, b. 20 Jan 1903, Echo, Dale County Alabama; d. 08 Mar 1976, Midland City, Dale County Alabama; m. VERA MAE WALKER, 21 Dec 1924, Dale County Alabama; b. 14 Apr 1906, Dale County Alabama; d. 10 May 1991, Midland City, Dale County Alabama. 25. DAVID5 RILEY (EMANUEL4, EDWARD3, JOHN2, EDWARD1) was born 1856 in Alabama. He married MATILDA NEWSOM 21 Nov 1888 in Echo, Dale County, Alabama. i. CHARLES6 RILEY, b. Mar 1890.
ii. DAISIE RILEY, b. Sep 1892.
iii. WILBURN RILEY, b. Sep 1894. 26. JOHN E.5 RILEY (WILEY WESLEY4, ABRAHAM3, JOHN2, EDWARD1) was born 25 Nov 1870, and died 19 Mar 1930. He married ISIBELLE RILEY 23 Mar 1898 in Dale County, AL. She was born 1863.
i. S. TILLMAN6 RILEY, m. ESSIE SPIVEY. 27. MILLAGE WALTER5 RILEY (WILEY WESLEY4, ABRAHAM3, JOHN2, EDWARD1) was born 22 Mar 1874, and died 08 Jun 1951. He married COSTILLA BRANNON. She was born 03 Sep 1876, and died 25 Mar 1964.
ii. DOT RILEY, b. 30 Jul 1916; d. 15 Jun 1918.
iii. DOVIE HATFIELD RILEY, b. 09 Jul 1905; d. 14 Apr 1984.
iv. LYMAN LEROY RILEY, b. 07 Aug 1897; d. 20 Oct 1974. 28. JAMES IRVING5 RILEY (WILEY WESLEY4, ABRAHAM3, JOHN2, EDWARD1) was born 24 Mar 1876, and died 05 Jul 1953. He married (1) SUSIE HOLLAND 09 May 1894. She was born 12 Dec 1871, and died 17 Dec 1903 in Dale County. He married (2) LENA ESTHER GRANTHAM 12 Mar 1904. She was born 13 Jan 1881, and died 08 Mar 1970.
v. SALLIE V.6 RILEY, b. 16 Apr 1905, Dale County, Alabama; d. 29 Jun 1935.
vi. RUFUS WILEY RILEY, b. 12 Feb 1907; d. 31 Jul 1974.
vii. TALLIE C. RILEY, b. 22 Jul 1909, Dale County, Echo, Alabama ; d. 28 Mar 1983.
viii. JOHN LOFTIN RILEY, b. 25 Dec 1911; d. 29 Dec 1972.
ix. VALLIE LEE RILEY, b. 08 Jan 1914; d. 03 Feb 1986.
x. HAZEL E. RILEY, b. 18 Jan 1915.
xi. JAMES CORBIT RILEY, b. 17 Nov 1916; d. 20 Nov 1916.
xii. MYRTLE RUTH RILEY, b. 1917; d. 20 Nov 1919.
xiii. BIRDIE RILEY, b. 26 Apr 1921.
xiv. MARY MAVIS RILEY, b. 26 Sep 1923; d. 30 Oct 2001; m. (1) FRANK BURNS PARNELL, 20 Mar 1943, Perry County, Linden, Tennessee; b. 11 Apr 1920, Perry County, Beardstown, Tennessee; d. 21 Aug 1992, Perry County, Linden, Tennessee; m. (2) OLIVER WENDELL HOLMES, 03 Nov 1956; b. 01 Aug 1929, Dale County, Alabama, and died in; d. 19 May 1991, Dale County, Midland City, Alabama. 29. THOMAS (TOMMIE) JEFFERSON5 RILEY (CURTIS4, ABRAHAM3, JOHN2, EDWARD1) was born Nov 1882 in Alabama. 30. JESSE PHILLIP5 RILEY (CURTIS4, ABRAHAM3, JOHN2, EDWARD1) was born Mar 1887 in Dale Co., Alabama, and died 25 Oct 1948 in Houston Co., Alabama. He married MARY ELIZABETH MERCHANT 23 Sep 1908 in De Funiak Springs, Florida, daughter of WILLIAM MERCHANT and MELINDA JERNIGAN. She was born 22 Aug 1894 in Escambia Co., AL, and died 13 Aug 1959 in Dothan , AL. Notes for JESSE PHILLIP RILEY: Pinckard census records indicate in 1900 he was living with his parents Curtis and Mary, with 6 other siblings. i. BESSIE LEE6 RILEY, b. 04 Aug 1909; d. 10 Aug 1993, Panama City, Florida; m. JESSE RABUN GATES, 1925; b. 1900, Alabama; d. 17 Jul 1975. Notes for BESSIE LEE RILEY: 1930 US Census- Bessie, Rabun and son Jesse Lane were living in Gadsden County, Precinct 9, River Junction Florida. Rabun worked at sawmill. Bessie, her husband Rabon (Jesse) Gates and son Jesse Lane Gates are all buried at the Galilee Methodist Church Cemetery near Graceville. ii. WADE H. RILEY, b. 31 Oct 1911; d. 03 Nov 1973, Chipley, Washington Co., FL; m. AGNES DEAN RHODES. iii. FRED CURTIS RILEY, b. 26 Jul 1916, Alabama; d. 24 Aug 1944, France. France after his tank took a direct hit through the turret. iv. GLADYS LUCILLE RILEY, b. 27 Apr 1914, Alabama; d. 21 Jul 1978, Panama City, Florida; m. FRANK AUGUSTUS CARR; b. 13 Jan 1911; d. May 1966, Panama City, Florida. v. MARY FRANCES RILEY, b. Nov 1919; m. ROBERT PAUL ETHERIDGE; b. Abt. 1918, Kinsey, Houston Co., AL. vi. JESSIE MYRLE RILEY, b. Nov 26 1922; d. Jan 21, 2000; m. 1) Paul Anderson 2) Richard E. Lile. vii. BILLIE RUTH (LAVENIA) RILEY, b. 01 Jun 1925, Midway, Gadsden Co., Florida; d. 15 May 1995, West Palm Beach, Florida; m. DALE CLYDE UNGER, 07 Sep 1943, Maricopa Co., AZ; b. 01 Jan 1911, Darke County, Ohio; d. 29 Jun 1972, Dothan, Alabama. 31. PEARLIE5 RILEY (CURTIS4, ABRAHAM3, JOHN2, EDWARD1) was born Jun 1893 in Alabama. She married DAN MERCHANT. He was born Abt. 1883.
i. MARIE6 MERCHANT, b. Dec 1914.
ii. HAMPTON MERCHANT, b. Dec 1918. 32. COMER5 RILEY (CURTIS4, ABRAHAM3, JOHN2, EDWARD1) was born Aug 1895 in Alabama, and died 1924 in Geneva County , Alabama. He married BELLE in Geneva County , Alabama. She was born Abt. 1900 in Alabama. i. MYRTLE6 RILEY, b. Abt. 1918.
ii. BUFORD RILEY, b. Abt. 1920, Alabama; m. (1) MARY LOIS TIPSWORD; m. (2) MARY LOUISE; m. (3) MARY RUTH. iii. JR. RILEY COMER, b. Abt. 1924.